Clair de Lune happens to be one of those pieces of music that has really seen me through ups & downs over the years -- not just the music itself, but playing it on the piano. I remember the first time I attempted it, I immediately knew I wanted to learn it by heart. And I did. I played and played it... after a long school day it was the best secret to relieving stress as a teenager, hands down (then again, playing piano was my favorite thing to do!). 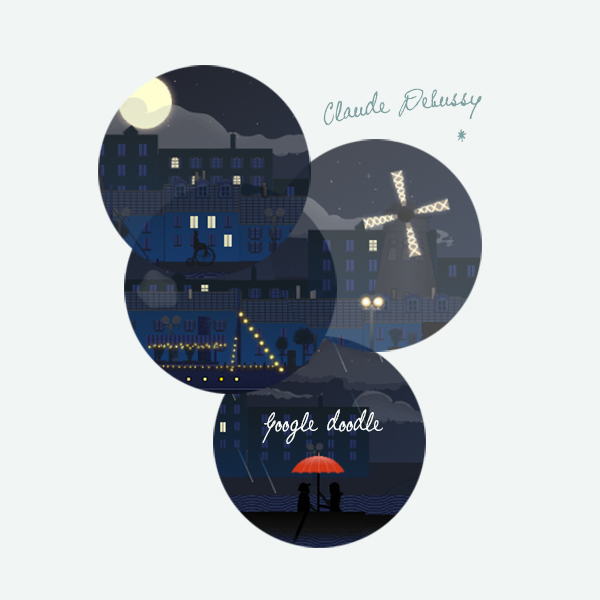 All this to say, I'm grateful to see today's Google Doodle (so much so that it got me posting again :) -- a tribute to Claude Debussy through a short animation featuring his amazing, wonderful little "moonlight" masterpiece. Go check it out! This is such a special piece to me, too! I was so pleased to see the Google Doodle early this morning. I played this piece many times in the lobby of the Grand Hotel with my pianist the summer I met Darryl.